The global market for drug and gene delivery systems features a largely consolidated vendor landscape with only a handful companies accounting for a dominant share in the overall market, observes Transparency Market Research in a recent report. So as to gain a larger hold on the market, companies are putting more emphasis on offering advanced products, ploughing more resources into R&D activities, and seeking new ways of expanding their product portfolios. Thus instances of strategic collaborations and partnerships in the drug and gene deliver market have increased significantly in the past few years. The strategic collaboration between Panacea Pharmaceuticals and 3M Drug Delivery System in 2017 for the development of a new cancer vaccine is a good instance of this prevailing trend in the market. Some of the leading companies in the market are Boston Scientific Corporation, Epeius Biotechnologies Corporation, Human Stem Cells Institute, Boston Scientific Corporation, Baxter International, Inc., and AstraZeneca plc. 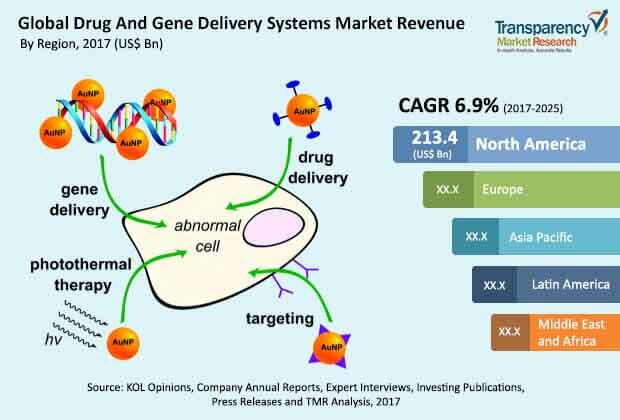 According to the report, the global drug and gene delivery market, which valued at US$510 bn in 2016, will expand at a promising CAGR of over 6% over the period between 2017 and 2025. Of the key drugs delivery systems associated with the drug and gene delivery systems market examined in the report, the segment of targeted drug delivery is expected to account for the dominant share in the overall market over the report’s forecast period; in terms of gene delivery systems, the segment of viral gene delivery system is likely to hold sway over the forecast period. Geographically, the markets in North America and Europe are expected to exhibit the most promising growth prospects over the report’s forecast period, thanks to the presence of some of the leading companies undertaking research in the field of drug and delivery in the regions. One of the key factors expected to work in favor of the global drug and gene delivery systems market is the steady rise in R&D activities in the area as companies in the healthcare sector increasingly understand the need for more effective drug and gene delivery mechanisms for the treatment of the mounting cases of a variety of chronic diseases. According to JAMA oncology, nearly 17.5 million cancer cases were diagnosed across the globe and around 8.8 million deaths were caused by the disease in 2015. With focus on the effective treatment of the condition increasingly rising from governments as well as pharmacy companies, the market for drug and gene delivery systems is likely to benefit from the scenario. The market is also driven by the rising numbers of new, advanced technologies making inroads in the field of drug and gene delivery and the rising application area of low dose targeted drug delivery. The increased demand for home health care and self-administering devices is also likely to work well in favor of the global drug and gene delivery systems market in the next few years. However, the market’s growth prospects could be hampered to a certain degree owing to the high cost of these treatment methods and several drug recalls to have hit companies in the past few years.